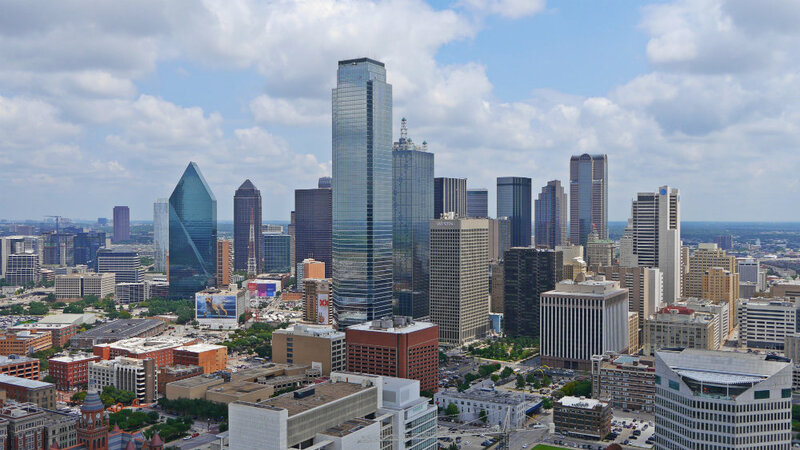 Dallas is officially the third most populous city in Texas, although its metropolitan area, which includes Fort Worth and other cities, makes it the most populated urban area in the state and the fourth overall in the United States. Dallas is considered one of the largest oil capitals in the world and one of the wealthiest cities in America. Its towering skyscrapers and the endless suburban sprawls that make up most of its residential areas give an account of the prosperity of this great city. They say everything is bigger in Texas, and Dallas is the largest city here. The economic weight of Dallas and the magnitude of its international airport make this Texan city a world-class business destination and the gateway par excellence to North Texas. With enough tourist attractions to spend a couple of days, it’s no wonder many travelers choose to stay in Dallas as a base for exploring the rest of the Lone Star State. Being a wealthy and prosperous business center, Dallas hotels tend to be on the expensive side of things, particularly the ones in more central locations. The average price for a room night in the Downtown area is about $ 150, a fare that tends to soar whenever there are fairs and congresses going on in the city. 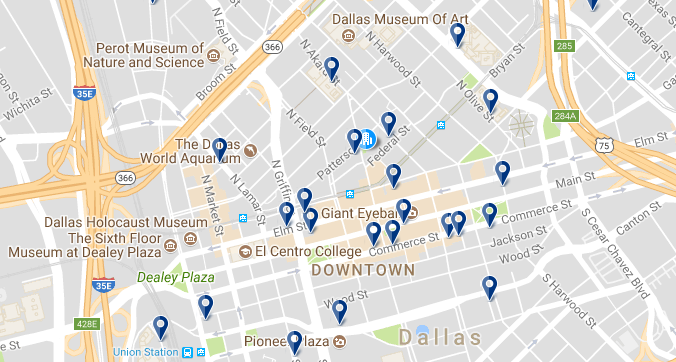 See hotels in Downtown Dallas. Even though prices can be high, the downtown area is definitely the most recommended area to stay in Dallas, especially if you are planning to stay in Dallas without a car. The city is huge and, although there is a metro system (called DART), its lines are rather scarce and trains infrequent. 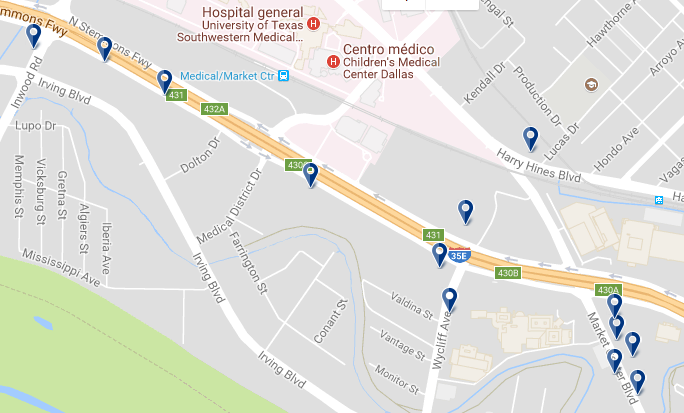 The cheapest area to stay in Dallas is Market Center, which has a DART station. It is located about 4 miles northwest of Downtown. See hotels in Market Center. 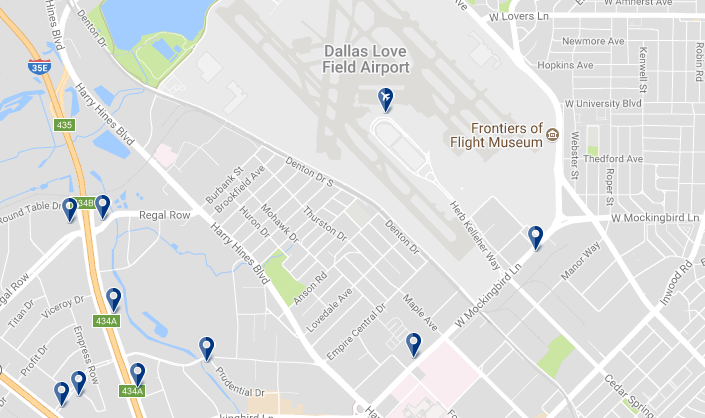 Another good area to stay in Dallas, especially if you travel with a car, is the Love Field area, near the secondary airport of Dallas.See hotels around Love Field. This is a list with the best areas to stay in Dallas, Texas. Downtown is definitely the best area to stay in Dallas if you are looking to be close to all of the city’s attractions and not have to get around too much by car or public transport. Downtown Dallas is the oldest area in ​​the city and has a great contrast of historic buildings and modern skyscrapers. All of the major attractions of the city are located in or around the Downtown area, including the site of John F. Kennedy’s assassination and its memorial museum, Reunion Tower, the Dallas Holocaust Museum, the Perot Science Museum and the Dallas Aquarium. 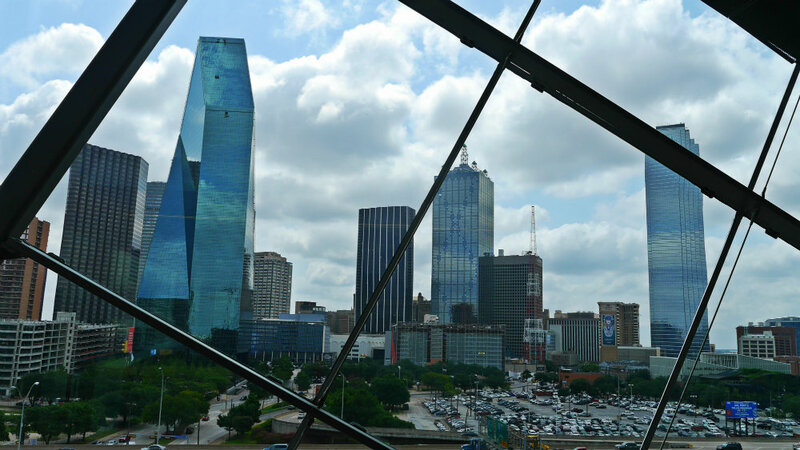 Downtown Dallas is also home to the Art District, which hosts numerous art museums, galleries and sculpture parks, including the fantastic Dallas Museum of Art and the Nasher Sculpture Center. The Downtown area is thoroughly connected by the DART system. Regional train and long-distance bus services are located around the central Union Square area. The Fairmont Dallas is a 4 star hotel located in the Art District of Dallas. Its rooms have modern décor. The closest DART station is only a 7-minute walk from the hotel. – from US$ 119. The Aloft Dallas Downtown is located in downtown Dallas, just steps from the Town Hall and the Kay Bailey Hutchison Convention Center. It offers rooms with free Wi-Fi and a small outdoor pool. – from US$ 99 . Indigo Dallas Downtown is just minutes from the Dallas Convention Center. It offers a restaurant, free Wi-Fi and a 24-hour gym. – from US$ 119 . The W Dallas – Victory is an upscale boutique hotel located in the Victory Park district of Dallas, Texas. It has an infinity pool. The rooms at the W Dallas Victory are modern and stylish. 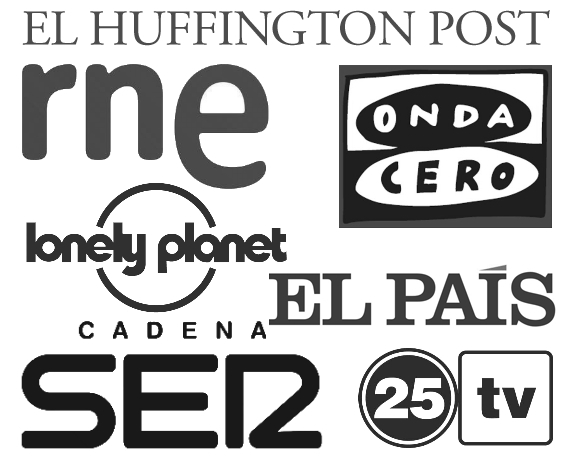 – from US$ 249 . The Market Center area is about three miles northwest of downtown Dallas. This area has the huge Market Center Complex, a huge exhibition and congress fair that attracts a lot of business visitors. For this reason the area has plenty of accommodation options, ranging from small budget motels to luxury apartments and plush international chain hotels. 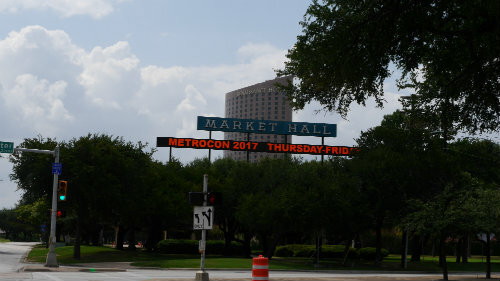 The prices of accommodation in this area are especially low (for Dallas standards), especially when there are no events going on in the fair complex. The area is connected to the rest of town with DART (orange and green lines). The Best Western Market Center has an outdoor pool and rooms with free Wi-Fi. Rooms come with a flat-screen TV and cable. – from US$ 68. Hilton Anatole is a luxury hotel located a 3-minute drive from the Market Center. It has spectacular rooms, a spa, a pool complex and restaurants. – from US$ 168 . 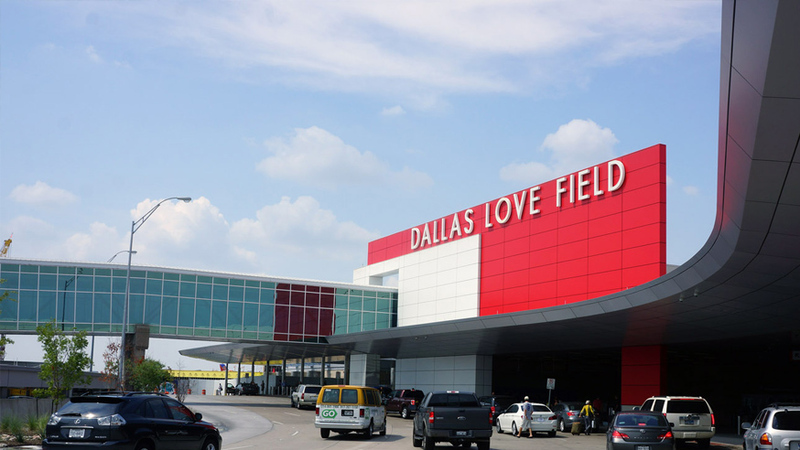 Dallas Love Airfield, also known as Love Field Airport (not to be confused with Dallas-Fort Worth International) is an airport located in central Dallas, it is an important hub for many of the large American domestic airlines like Southwest, Virgin America or Spirit . 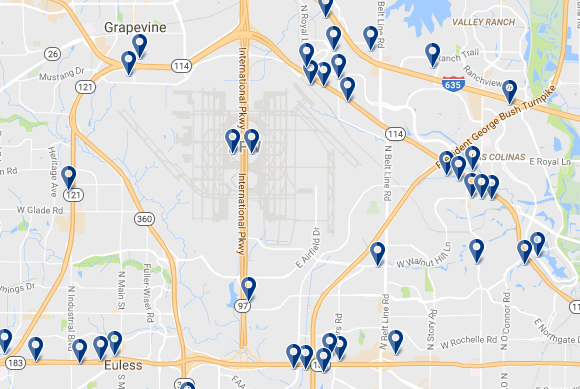 Love Field is located approximately 7 miles from Downtown Dallas, and the surrounding area has lots of mid-range and budget hotels. Dallas Love is probably not the best area to stay in Dallas if you are looking to enjoy the attractions of the city, but its large number of budget hotels and easy access by road to the rest of the Dallas-Fort Worth area and the convenience of being near the airport if you have a domestic flight make it an attractive area. It’s specially convenient for travelers visiting Dallas with a car. The green and orange DART lines have several stops in the area. Embassy Suites Dallas – Love Field is located just minutes from Dallas-Love Field Airport and offers free airport shuttle service (to Love Field) and spacious rooms. It also has a swimming pool. – from US$ 119. 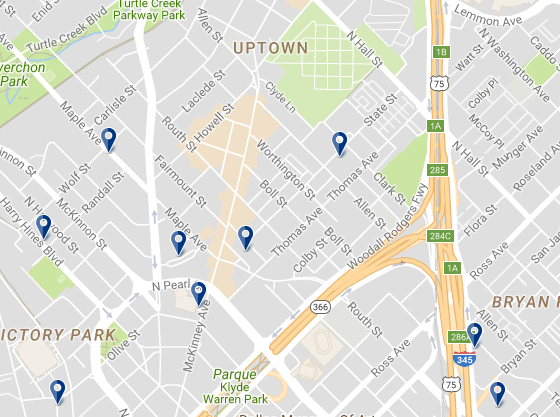 Uptown is a quiet upmarket area, located north of Downtown Dallas. This area has a lot of new apartments, trendy bars, restaurants and many of the best shops in the city. 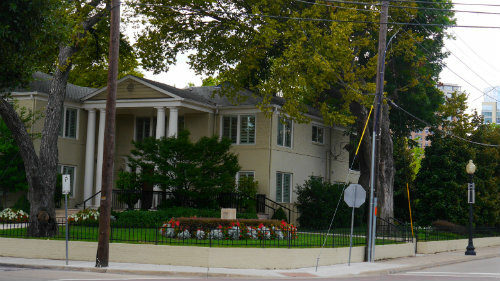 Young professionals dominate the social scene along McKinney Avenue, and the Knox Street area is traditionally more bourgeois, with terraced houses and luxury apartments. Uptown Dallas is one of the oldest neighborhoods in the city and features tree-lined streets, elegant Victorian mansions, and shopping and leisure centers for Dallas’ upper classes. The hotels in this area are usually luxury properties, although there are some cheaper boutique options. The Dallas Uptown area is connected by cablecar line M.
It is one of the best areas to stay in Dallas if you are looking for a quiet, upscale area. It’s also OK for travelers without a car as taxis are widely available and there’s a cablecar connection to the Downtown area and DART stations. Hyatt House Dallas Uptown, with an outdoor pool and a hot tub, is located 500 yards from the American Airlines Center. The property also has a bar. – from US$ 149. Hotel ZaZa Dallas features a full-service spa with massage and skincare tratments. There is free WiFi. Rooms at Hotel ZaZa Dallas feature Mediterranean-style décor with unique artwork. – from US$ 259. Dallas-Fort Worth is the largest airport in Texas and the third busiest airport in the world in terms of air operations. It is located between the cities of Dallas and Fort Worth and, because it is an American Airlines hub, receives large numbers of domestic and international flights. Given its importance as a connection center, the area around the airport is full of hotels of all types and budgets. DFW airport is located far from downtown Dallas, so this area is only recommended if you want to have easy access to the airport. That said, DFW airport is connected via the DART and regional trains to both Dallas and Fort Worth. Quality Inn & Suites DFW Airport South, with an outdoor pool, is ideally located just 2 miles from Dallas / Fort Worth International Airport. This hotel offers a free continental breakfast and free Wi-Fi throughout the property.- from US$ 69.